Foreigners who re-enter Russia illegally to face imprisonment | Russian Legal Information Agency (RAPSI). MOSCOW, November 27 - RAPSI. The Russian government has submitted a bill to the State Duma introducing criminal liability for immigrants who were previously deported from the country and who then intentionally cross Russia's state border illegally, the State Duma's official website reported on Monday. The bill will introduce a punishment of up to four years in prison for foreigners who cross the border despite having been barred from entering or reentering the country. The punishment for organizing illegal immigration will be increased from five years to six. 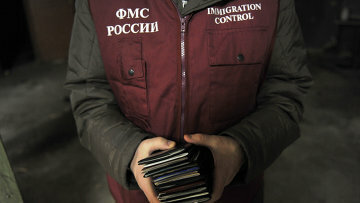 The Federal Security Service, the Interior Ministry, the Federal Migration Service and the Federal Drug Control Service have evidence that foreigners who were previously expelled from Russia often get new passports with different surnames and re-enter the country again, in full knowledge that they are violating Russian law. Between 2009 and 2011 the Federal Security Service detected 591 foreigners who had been expelled from Russia and who then re-entered the country under another name. In 2009, there 162 cases of this kind, there were 138 in 2010 and 291 in 2011. 11:07 27/11/2012 The Russian government has submitted a bill to the State Duma introducing criminal liability for immigrants who were previously deported from the country and who then intentionally cross Russia's state border illegally.